My recent Fulbright Fellowship at Arizona State University introduced me to several exceptional and engaging Arizona writers. They inspired me to inaugurate a new Folio section, which will regularly feature a selection of writers under a single theme or from a specific location. In this issue, readers will discover several talented artists working in Arizona, a desert-country culture where the heat often brings out what’s bred in the bone. 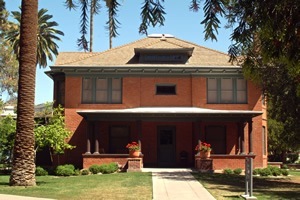 My position at Arizona State University was hosted by The Virginia Piper Center for Creative Writing and the College of Liberal Arts and Sciences. The Center is the original President’s cottage, located on the corner of Palm Walk and Tyler Mall. Built in 1907, the house and grounds provide idyllic spaces for writers to work and gather for literary readings. The Center brings visiting writers of exceptional talent and distinction to the ASU campus and the greater Phoenix metropolitan community for public lectures and residencies. Visiting writers teach graduate seminars, lecture on and off campus, and engage in cultural discussions with local media, educators, community artists, and the general public. For the past five years, the Center has hosted a Canada-U.S. Fulbright Research Chair in Creative Writing. I was privileged to hold this position in 20019-2010. During this time, I met and engaged with the vibrant literary and scholarly community in the 2009-2010 year, including: Jewell Rhodes, Virginia Piper Endowed Chair: Peter Turchi, Director of Creative Writing; Cynthia Hogue; Alberto Rios; Sally Ball; Sylvain Gallais; Rosalynn Voaden; and fellow visiting Canadians: Joseph Boyden, Warren Carriou and Alison Calder. My thanks to all who made my time at the Center a writer’s adventure of a lifetime. My essay, “Turquoise, Water and Sky” was an award winner in the Fulbright Alumni Association contest. It was written in response to their call to describe, in a thousand words or less, our Fulbright Fellowship experiences.